Congratulations to Master’s in IT student, Pieter Delport, who has been awarded the S2A3 Medal. The Southern Africa Association for the Advancement of Science (S2A3) Masters Medal (Bronze Medal) serves to commend outstanding South African research students graduating at the Masters level in a scientific discipline. These medals are awarded annually to one candidate selected by each South African university. 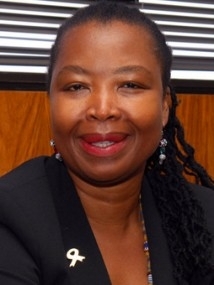 Council is delighted to announce that Dr Sibongile Muthwa has been appointed the new Vice-Chancellor and Principal of Nelson Mandela University. Dr Muthwa, who has served as the University’s Deputy Vice-Chancellor for Institutional Support for the past seven years, serves as the institution’s first black African female Vice-Chancellor and brings to the post a wealth of experience from the public sector and academia, both nationally and abroad. Dr Muthwa takes over the reins from outgoing Vice-Chancellor, Prof Derrick Swartz, who has served the institution with distinction for two successive terms since 2007. Earlier this year, Prof Swartz indicated his wish not to renew his contract, setting in motion an extensive recruitment drive. At a sitting of the University Council on Friday 13 October 2017, Dr Muthwa was unanimously selected as the successful incumbent. Dr Muthwa has a distinguished career in both South Africa and the United Kingdom. She spent many years, holding leadership positions, in development, public sector, and academic institutions and managing complex issues and situations with skill and enormous courage. These skills have come in very handy in the last few years, when a myriad of challenges within the higher education sector were foregrounded by the student protests around affordable higher education and other developmental challenges facing our country and continent today. Speaking of her appointment Dr Muthwa said she was extremely humbled by the confidence shown in her by the University Council and looks forward to leading an institution that is set to distinguish itself nationally and continentally as a new generation university. “I've spent 30 years dedicated to public service, so this is one of the crowning moments of my career,” she said. “Our university, sector and country are at a crossroads. We can use the prevailing situation to our advantage. At Nelson Mandela University we are hard at work implementing strategies not only intended to enable us overcome the challenges we face, but also to place us firmly on a positive growth trajectory. I am looking forward to working with the team to collectively take the university to greater heights. “I am very much indebted to Prof Swartz for his sterling and visionary work, his inspirational leadership and for laying a firm foundation which has contributed to making the university what it has become”. Between 2004 and 2010 Dr Muthwa served as Director General of the Eastern Cape Provincial Government. Before joining government, she was Director of the Fort Hare University Institute of Government for five years. In 2014 she was appointed as a Commissioner for the Financial and Fiscal Commission (FFC) and was appointed Deputy Chairperson of the Commission earlier this year. Dr. Muthwa holds a PhD from the prestigious School of Oriental and African Studies (SOAS) at the University of London. Her other academic qualifications include an MSc in Development Policy and Planning (London School of Economics), BA Honours (Wits) and BA in Social Work (UFH). She enjoys wide support from the University community and the higher education and public sectors. Prof Swartz congratulated Dr Muthwa on her appointment, hailing it as a historic moment in the life of the university. “It is an exceedingly proud moment for us all. Dr Muthwa serves doubly as the first female Vice-Chancellor and first African female Vice-Chancellor in the history of the University, and without doubt will inspire new generations to rise to the highest levels of achievement. We are absolutely delighted with her appointment” he said.